It is often said that there is too much ‘rubbish’ information on the web. To be sure, there is rubbish but there’s rubbish everywhere. There is certainly not so much that the internet should not be used for research. This would of course be foolish. Like all vaults of information, one must discriminate and discard and hone, until you arrive at what you believe to be the nearest to accurate you can reasonably achieve. This is the case with our efforts in trying to discover how a sandbank off the east coast of Ireland, the Kish Bank, got its name. Thanks in large part to the internet and all those who contribute to it, we seem to be making progress. It is clear, well almost, that the term Kish or Kishes as plural, was used throughout the British Isles during the time the Norse people settled in Ireland, and maybe before then. Spelt ‘Ceis’, it also has roots in the Irish language. Though there are places named Kish, the word was commonly used in the context of baskets or closed wicker (willow) ‘fencibles’ into which stones or clays were placed to construct walls, coffering and ‘bridges’. The reclamation of the Lifey estuary was in large part completed with piles and a network of ‘kishes’ that were laid and constructed, into which stones were filled. It was also a word in everyday use in Ireland during the 18th century as a description for a basket that carried turf. It became a unit of measurement in this respect but whether that measurement became universal or varied with sizes is not known. In 1857, ‘8d was being paid for a statute kish of turf’. Adapted, the same baskets could easily have been used to catch fish and shellfish (in the case of fish, reeds may also have been used) and may help in making a convincing link to its use in ancient Hebrew – meaning ‘to snare’ or ‘to trap’ etc. – fishing for example. The ‘basket(s)’ design was obviously then multifunctional according to requirements and were used accordingly; to carry, crops, building materials or to fish. Fishermen’s stores & gear…’3 kishans of salt’, 1755. ‘2000 Manx Mariners’. “Each cabin requires at least twenty-five kishes for the consumption of one winter. … One ton of coals is equal to fourteen kishes of turf..” (The Monthly Review, Ralph Griffiths, 1813.) etc. 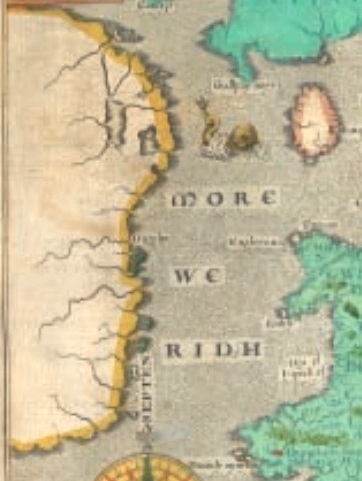 Early maps depict the sandbanks along and off the east coast of Ireland (proceeding northwards) as; New Ground, South Ground(s), Middle Grounds(s) and North Ground(s). The most northerly end being depicted directly east of Bray Head. On some maps the most northerly has no title. The sandbank we know today as the Kish Bank, was not represented or named on these. Earlier depictions of these ‘grounds’ are not in outline but are ‘coloured in’ and surrounded by ‘shading’ or ‘broken water’, suggesting they were a solid mass. That is, they were above the water or maybe for only some of the time. In fact, some of the 16th century Dutch maps depict these ‘grounds’ in exactly the same way as islands such as the Saltees, Howth and Lambay etc. Interestingly, they do not depict other sandbanks that we know existed then and remain to this day; Burford, Bennet, Frazer and the sandbars that straddled the entrance to Dublin. However, as we can see from early 17th century sailing instructions, the Kish and its position was clearly known about. Unfortunately, unlike other sandbanks and islands mentioned, the cartographer gives no indication if it is either. Curiously, in the 1595 map, the ‘grounds’ are actually joined to the land and the Arklow Bank is shown quite differently. This type of depiction continues into the 19th century on some maps but there is a historical overlap of representation. In some maps/charts dating back to the late 18th century there are representations of the Kish Bank and these also include this title. Just like today, existing maps were often just copied, and although updates and new data had been added, these were not in wide circulation. There was also an essential difference between maps and charts. The maps were largely designed for land people and general instruction, and charts were designed by mariners for mariners. It should also be understood that at one time, the Kish Bank or The Kishes was meant to include all of the Kish Bank, the Bray Bank and the Codling Bank as we understand their extent today. S.S.E.–The Island of Lambaye and the Road of Dalkaye lie S.S.W. and N.N.E. 5 leagues. The banks of Wiclay begin athwart the Frith of Dublin, and continue till Tusker, N. and by E., S., and by W. 21 leagues long. The Kishe lies in the fair way, keep islands in the head of Howthe and you hit it. Tusker and Smalie lie S.W. and by S. and N.E. and by N. 14 leagues. From a rutter by Grander made 1623. Sonar Image of the Kish Bank today. Courtesy of Infomar and Irish Seabed Survey. The Kish Bank provides above average fishing today. It is also a breathing ground and nursery for fish. Fishing there however, was previously excellent until well into the advent of mechanically powered fishing trawlers. This would seem to fit with the idea that the Kish Bank may have been known as the Kishes for the reason being, that there was excellent fishing on these ‘grounds’ for a very long time and that some kind of basket traps may have been employed for fishing there. It is recorded that there were extensive oyster grounds on the Kish Bank. This idea might extend to a suggestion that these grounds where not only very shallow, as they are today, but that they were actually above the water and ‘Kishes’ were stored on it during the fishing process and a season. Many years ago I spoke to fishermen who remembered when parts of some of the banks there and in the Bay of Dublin ‘dried’. Recounting to me, that “you could even get out of your boat and walk on them”. While accounts such as these travelled in folklore they were by enlarge not reported. The reason for this we may assume, is that they were infrequent, local, and occurred far from shore. And their only witnesses were fishermen and sailors who largely lived on the fringes of society. Although these Banks can become very shallow during certain tides (6 feet has been recorded at north end, and 4 feet on the Codling), they do not seem to have ‘dried’ in more modern times. In addition, just as in the construction of fencibles and fish traps, on or at the shore, similar fish traps may have been constructed off shore in the tidal shallows around these fishing ‘grounds’ which straddle along and off the east coast of Ireland between Dublin and Wexford. Such methods of trapping fish were and are still employed in inter-tidal areas around the coast of Britain. 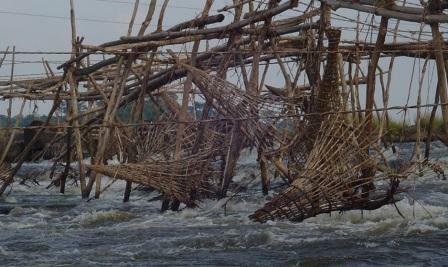 Basket fish traps in middle east today. There is an island on the SW coast of Iran close to the Straits of Hormuz in the Persian Gulf. A position guaranteeing that so long as there is a demand for oil, it will continue to be a focus of international attention. Its name is Kish. It is an island of 3000 years history and its geography has very similar characteristics to the Kish Bank off the east coast of Ireland. It has been noted through the millennia for its ‘sweet water’. Kish is one of a number of small islands strung along and off the coast in similar fashion to those off of Ireland. 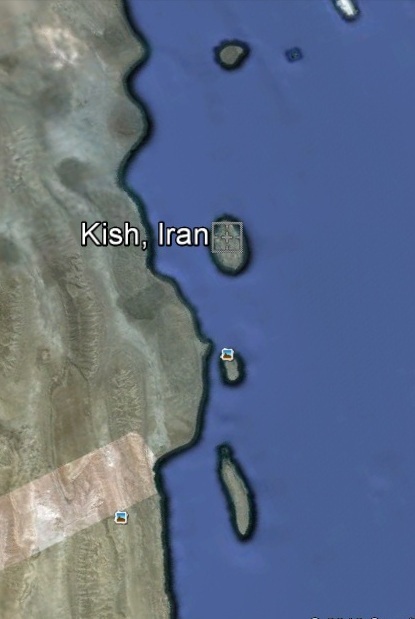 Kish has similar dimensions to the Kish Bank and is extremely low lying. Much of the island is only a couple of meters above the sea. The majority of it is between 10 and 15 metres, rising to a raised area of 30-40 meters around its airport. The similarities to a once slightly raised Kish Bank might be striking. They would of course be similar to many other sand or coral banks but these wouldn’t have the same very unusual name – Kish! To the north there is another and older known ‘Kish’. This was the city of Kish situated in the Euphrates valley about 80kms south of Bagdad. 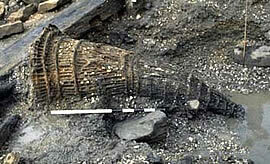 Its history is older than the island of Kish, dating back more than 3000 years BC. What is particularly interesting about this ancient city for us, is, its people, the Sumarians who lived in, on and around the Euphrates river basin. A highly developed people, they were known to have acquired a particular proficiency in the use of reeds. They used them for almost everything, including writing. They were also particularly successful with agriculture and exported grain to many countries around the Mediterranean basin. So, if you received a shipment of grain from this ancient city, you might say that you got it from the Kishes. Do we need to choose, which Kish? During and extensive search and survey of shipwrecks on the Kish Bank over a period of more than ten years, approximately 20 shipwrecks have been located and identified(some dated approx). Although the Kish Bank has been known for centuries as presenting a serious hazard to shipping, this number of shipwrecks does not seem to be very high. What is particularly interesting about these discoveries is; none are older than the first half of the 19th century. This suggests, that either the remains of earlier shipwrecks were smaller, less well constructed or are now just covered over by sand. 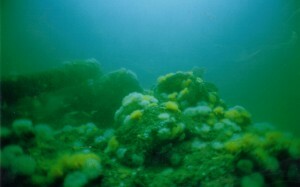 It may also suggest that the Kish Bank, if visible at an earlier time, that it did not present the same danger to navigation as when it was later covered and hidden. Through the centuries there have been a number of earth-moving natural phenomena (Most recently new islands off Pakinstan and Japan in 2013) which might support a view that these sandbanks may have ‘settled’ lower than they appear now. Much of the Kish Bank ranges from as little as 3-10 metres. This investigation is continuing and maybe – you never know? It is easy and convenient to suggest that the ‘grounds’ were a term to indicate that these were a place of danger, boats ‘grounding’ or ‘taking the ground’ etc. Or that they were ‘fishing grounds’ – the term ‘grounds’ being in use today to describe traditional fishing areas. And along came cartographers and surveyors in the 18th and 19th centuries, such as Scale, Richards and Frazer who surveyed these areas in more detail and gave names to their discoveries. 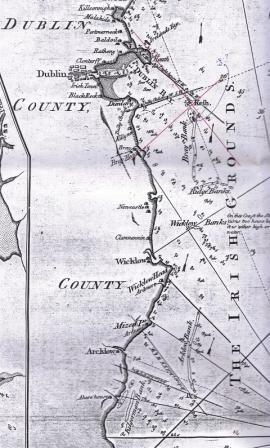 For example, the long stretches of sandbanks along the east coast of Ireland are known as, the Blackwater, Arklow and Wicklow Banks, being named in relation to the geography of their corresponding coastline. There are other sandbanks that their surveyors gave the names of people and ships to. Such as; Frazer, Bennet, Burford and Lucifer. If the original reference to these banks were ‘grounds’ and they were subsequently renamed by cartographers and surveyors, why and when did they come to choose Kish? A clue might be found in the shape of this bank. 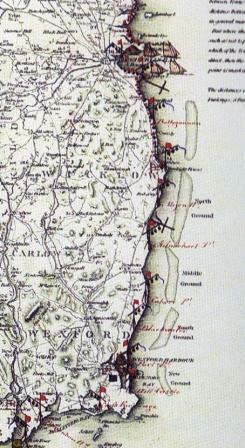 It can be seen in the 1783 chart that the Kish Bank(including the Bray Bank) tapers from north to south (The Tail) and could be said to resemble a ‘Kish’ type basket. Finally, the question that rises is of course: If the term Kish or Kishes was brought to Ireland by the Vikings, did someone bring it to them? Or if they didn’t, then who else might have named the North Ground or a ‘ground’ above it, as, The Kishes, The Kish Bank, etc., situated 7 miles off the coast of Dublin? It has long been suspected that there is a connection between Ireland’s arts and culture and those of the Middle East, and that the Romans settled and or traded to some unknown degree with the east coast of Ireland. And a final finally, Providence is not only God but so too an ‘Irish’ company busy exploring and surveying the Kish Bank for carbon fuels. Perhaps, Providence will discover The Light, and deliver the Irishalites from the Troika? Posted by roystokes. Categories : Archaeology, Diving, Liverpool, Local Irish History, Maritime Adventure, Maritime Mysteries, Tales of Shipwreck, Uncategorized. Tags : basket, Bray, fish trap, Hormuz, Infomar, Iran, Kish, Kishes, Red Sea, sandbank, Wicklow.